Merry Christmas! I know it is Christmas Eve, but I wanted to give you a quick update on all the charitable projects I’ve been working on. This past weekend I finally installed the silver and gold Christmas tree for the Christmas in the Community campaign. I posted about the tree earlier, and the install was a wonderful experience. On behalf of ChristmasTreeMarket.com I donated the tree to the Mary Isaak Center, a shelter for homeless children and their families. You can visit the COTS' website to learn more about the program and the people they serve. The tree was fabulous in the space. I didn’t realize the walls of the lobby were a creamy yellow color, which coordinated perfectly with the gold and silver color scheme. I love that it sits in the front window, a sparkling beacon for the weary souls entering their doors. Isn’t that wonderful window art? It was painted by one of the residents. He had multiple pieces throughout the Mary Issak Center. They were stunning in person. As we were leaving one woman grabbed my arm and thanked me for the tree. She said “I didn’t think we would have a tree this year, and this makes it really feel like Christmas!" I know that was the goal of the Christmas Tree Market’s campaign.. but hoping you will brighten someone’s Christmas is not the same thing as KNOWING you did. The foundation that runs and oversees the Mary Issak Center is COTS (Committee on the Shelterless) and they also have additional projects, including the Work: Ready program which prepares the homeless to re-enter the workforce. One of the big needs for work-readiness, besides training and preparation, is work clothes. Jenna Garcia, who heads the program, recruited Kate (Censational Girl) to help create a space where people in the program could “shop” for work clothes for free. Over the past few months, I’ve driven up to Sonoma County (north of San Francisco in 'wine country') and helped Jenna and Kate with a few aspects of this space transformation. 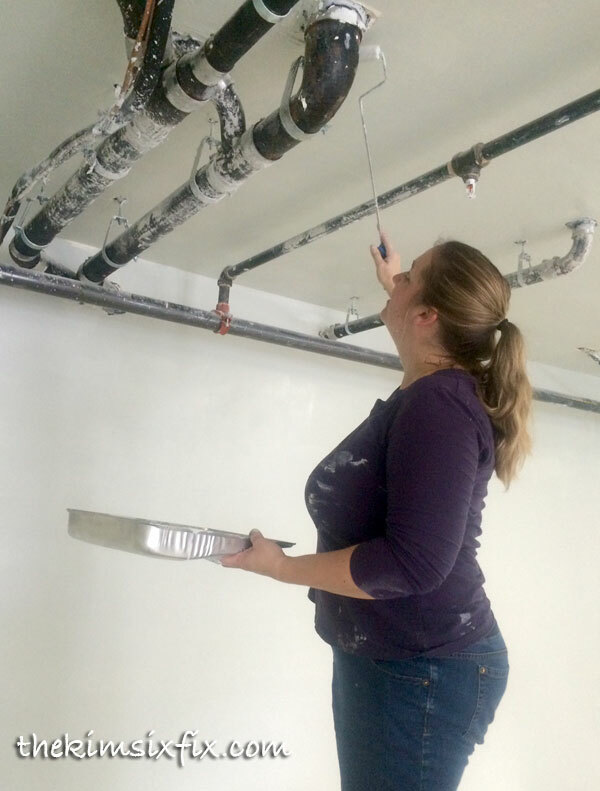 We spent a lot of time painting, and Jenna recruited volunteers to install dressing room walls. Kate secured sponsors and we installed the pipe clothing racks. To make the location feel more like a ‘real’ storefront I told Jenna that I knew my Silhouette could probably create a nice door sign, and she took me up on the offer. Jenna designed the logo and I spent one weekend afternoon cutting and transferring the design (along with donation information and the street address) onto the front doors. It wasn’t always glamorous, and it was a lot of work but when the project was done, it was beautiful. I also want to mention that this project was 100% funded by volunteer donations, and sponsors. No other funds were used. I am stunned with how altruistic people can be! Christmas Tree Market also donated a tree for this space and Kate decorated it. It sparkled during the open house. There is still more that can be done in the space, and Jenna has a full wish list.. not only for the Work:Ready Apparel storefront but for the entire COTS program. If you are local (in the Petaluma area) you can find the wish list for donations here. If you cannot donate items directly, you can also donate monetarily online. The COTS programs aren't the only way of giving back this year. Next week I'll be sharing how you can help those less fortunately by donating a gently used coat at Burlington Coat Factory. And don’t forget about my other favorite way to thank a Veteran this holiday season. By sending a Cookie Care Package. There are so many ways to give gifts this holiday season, that have very little to do with what is actually wrapped up under your tree. And often those are the best gifts of all!